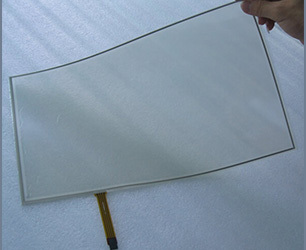 4 wire resistive touch film comprises several layers, the most important of which are two thin, transparent electrically-resistive layers separated by a thin space. These layers face each other with a thin gap between. The top screen (the screen that is touched) has a coating on the underside surface of the screen. Just beneath it is a similar resistive layer on top of its substrate. One layer has conductive connections along its sides, the other along top and bottom. A voltage is applied to one layer, and sensed by the other. When an object, such as a fingertip or stylus tip, presses down onto the outer surface, the two layers touch to become connected at that point: The panel then behaves as a pair of voltage dividers, one axis at a time. By rapidly switching between each layer, the position of a pressure on the screen can be read. Resistive touch is used in restaurants, factories and hospitals due to its high resistance to liquids and contaminants. A major benefit of resistive touch technology is its low cost. Additionally, as only sufficient pressure is necessary for the touch to be sensed, they may be used with gloves on, or by using anything rigid as a finger/stylus substitute. Disadvantages include the need to press down, and a risk of damage by sharp objects. Resistive touch screens also suffer from poorer contrast, due to having additional reflections from the extra layers of material (separated by an air gap) placed over the screen. 4. Sample for testing acceptable, 3-5 days delivery time after payment confirmation. 5. Application: MID, digital photo frame, vehicle GPS, POS, kiosk. ad displayer, ATM, inquiry machine, terminal equipment, self-service device, medical equipment, industrial equipment, game machine, education displayer, ticket machine, etc. 5).widely application for POS, terminal, ad displayer, game machine, lcd monitor, etc.